Some of our readers have reported that they are unable to turn on iPhone or iPad. More specifically, it has been reported that the iPhone or iPad does not boot into iOS (iOS device will not start up) when it is connected to a power outlet. When the iPhone or iPad is plugged in, the Apple logo appears for about 3 seconds, then disappears (blank screen) for about 2 seconds and this process (the Apple logo keeps flashing) repeats itself indefinitely. Are you having this problem too? Is your iOS device stuck on the Apple logo loop? Stuck on Apple Logo Screen? If you own an iPhone 7: press and hold the on/off (sleep/wake) and volume down buttons until you see the Apple logo (ignore the “Slide to power off” screen if you see it). If you own other iOS devices (iPhone 6, iPad or iPod etc): press and hold the on/off and home buttons together until you see the Apple logo (ignore the “Slide to power off” screen if you see it). For this, you will need to use a computer, PC or Mac, with iTunes installed. Connect your iPhone or iPad to your computer with the USB cable. 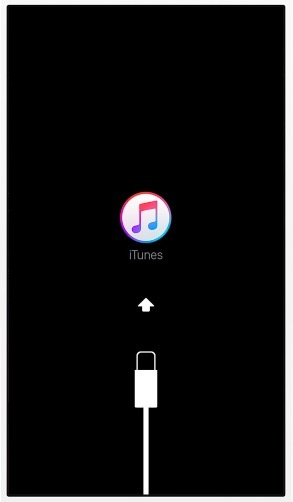 If you have an iPhone 7: press and hold the sleep/wake and volume down buttons together until you see the Connect to iTunes screen (or recovery mode screen). If you have other iOS devices: press and hold the sleep/wake and home buttons together until you see the recovery mode screen. Now iTunes will say that it has detected an iPhone, iPod touch, or iPad in recovery mode. You will see the option to Restore or Update. Simply choose Update. Lastly, you may also review our other articles. We wrote about similar problems such as ‘black screen‘, ‘black screen with spinning wheel‘ ‘random rebooting‘, and ‘dead devices‘. If you are still having the issue, contact Apple support. Mine is doing the same thing and none of the “tricks’ seem to work. iPhone 7 screen was replaced. After I replaced it an made sure everything was connected an secure. Connected to a power source. It just blinks on an off with apple logo. Connected it to my computer to iTunes stopped blinking the logo just a dark screen like its not even connected to a power source. My IPhone 7 has similar problem of having a slow flashing apple logo screen (i.e. for 6-7 secs it is ON and for next 3-4 secs it stays OFF). I tried this trick. No use. What are the other ways of getting it resolved. Damn apple devices. There is always some problem. Firstly my ipad keeps turning off with no apple logo but a loading screen, and then it turns on normally (still connected to wifi, bluetooth etc.) , minuteslater it does the same thing again and again why is this happening and what is the solution. Tried force stopping and updating apps, don’t work. I am suspecting a virus (although i checked antivirus no problem) or a cpu overload. I may try to reboot after backing up. On iphone 7 hold down/in power and vol down button with phone connected and itunes running. keep holding for at least 20 secs. it worked for me and now i am on update screen with itunes. Will let you know what happens..
My iPad is stuck on the apple logo loop, the problem is that my power button is broken too. What do I do? Android on How to Turn Off Two-Factor Authentication? Aguy on What Does Alarm Clock Icon On An App Mean (iPad)?